FAN-ATIC, Vol 1, No 2. March 1941. Page 4. THANKS, DEPRESH! Continued. by Forrest J. Ackerman. 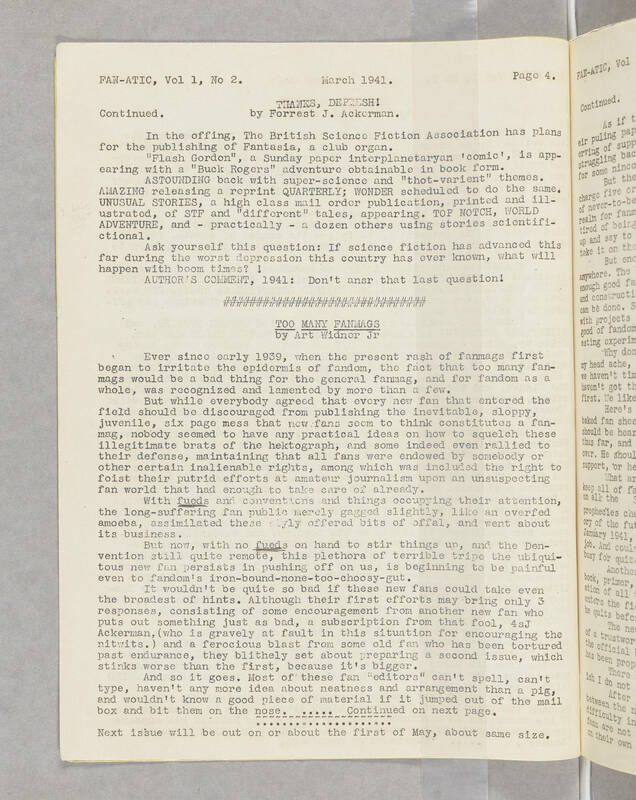 In the offing, the British Science Fiction Association has plans for the publishing of Fantasia, a club organ. "Flash Gordon", a Sunday paper interplanetaryan 'comic', is appearing with a "Buck Rogers" adventure obtainable in book form. ASTOUNDING back with super-science and "thot-varient" themes. AMAZING releasing a reprint QUARTERLY; WONDER scheduled to do the same. UNUSUAL STORIES, a high class mail order publication, printed and illustrated, of STF and "different" tales, appearing. TOP NOTCH, WORLD ADVENTURE, and - practically - a dozen others using stories scientifictional. Ask yourself this question: If science fiction has advanced this far during the worst depression this country has ever known, what will happen with boom times? ! AUTHOR'S COMMENT, 1941: Don't ansr that last question! TOO MANY FANMAGS by Art Widner Jr Ever since early 1939, when the present rash of fanmags first began to irritate the epidermis of fandom, the fact that oo many fanmags would be a bad thing for the general fanmag, and for fandom as a whole, was recognized and lamented by more than a few. But while everybody agreed that every new fan that entered the field should be discouraged from publishing the inevitable, sloppy, juvenile, six page mess that new fans seem to think constitutes a fanmag, nobody seemed to have any practical ideas on how to squelch these illegitimate brats of the hektograph, and some indeed even rallied to their defense, maintaining that all fans were endowed by somebody or other certain inalienable rights, among which was included the right to foist their putrid efforts at amateur journalism upon an unsuspecting fan world that had enough to take care of already. With fueds and conventions and things occupying their attention, the long-suffering fan public merely gagged slightly, like an overfed amoeba, assimilated these slyly offered bits of offal, and went about its business. But now, with no fueds on hand to stir things up, and the Denvention still quite remote, this plethora of terrible tripe the ubiquitous new fan persists in pushing off on us, is beginning to be painful even to fandom's iron-bound-none-too-choosy-gut. It wouldn't be quite so bad if these new fans could take even the broadest of hints. Although their first efforts may bring only 3 responses, consisting of some encouragement from another new fan who puts out something just as bad, a subscription from that fool, 4sJ Ackerman, (who is gravely at fault in this situation for encouraging the nitwits.) and a ferocious blast from some old fan who has been tortured past endurance, they blithely set about preparing a second issue, which stinks worse than the first, because it's bigger. And so it goes. Most of these fan "editors" can't spell, can't type, haven't any more idea about neatness and arrangement than a pig, and wouldn't know a good piece of material if it jumped out of the mail box and bit them on the nose. Continued on the next page. Next issue will be out on or about the first of May, about same size.